After breaking into a bank vault, this infamous getaway driver had no idea that the police had a sting operation set up. Now the driver will have to use the cops in the tight alleys of this warehouse district. Stay alive, wreck cop cars, and avoid the gun fire until your friends can arrive and help you out. Use the Arrow Keys to drive and drift in this getaway van. Your goal is to drift yourself in the ring in each level to progress. Move at the speed of neon and shine your way through the empty black never forever. Collect colored power ups and keep your balance as you flash flicker fade your way from start to finish. Online flash one-on-one fighting game with a fighter creation feature. Drag the Slammings with your mouse to knock them dead before they reach the end of the level, creating kill combos to unlock new tools. 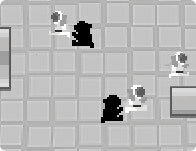 An original remake of the classical breakout game to play against the computer or your friend.